Having your very own gym at home has a lot of perks. It doesn’t matter if you’ll opt for a “cell block style,” an “ultra-posh style,” or somewhere it between. What’s important is that you’ll be able to incorporate your fitness goals and feel more motivated to work out. But where do you start? How much space do you need? What equipment is best? How much should you spend? In this article, we’re going to answer all of those questions, and we’ve even got answers from four industry experts on what the best gym equipment to start off with is. Your home gym should be bright, invigorating, and pleasant. This would inspire you to strive for the best and take your workouts seriously. For that to happen, the first step you ought to do is, pick an area and determine the amount of natural light it usually receives. Though, because of space issues, most people use their basement or garage as a workout room. Since these areas don’t have much source of lighting, they could be gloomy and depressing for a home gym. You could easily counteract this effect though. By installing bright lighting and painting the walls with a light color, it could brighten up the atmosphere. You could use yellow, red, or orange and it would instantly energize your home gym. As a rule of thumb, just go with the lighter shade if you’re going to work out in a cramped or dark space. Likewise, never choose a color that’s so bright, it’s over stimulating. Lastly, have a look at the floor. When it comes to home gyms, it’s always recommended to go with rubber flooring because it offers traction. Thus, it wouldn’t be damaged even when you accidentally dropped the dumbbell or you’re planning to transfer your heavy exercise machine to a different spot. Also, it’s soft enough that you could perform high-impact aerobics, as well as floor exercises. Don’t forget to include mirrors as well. To be more motivated, post a photo of your favorite athletes, and anything that gives you inspiration. A great way to stick to your goals is to have an inspiration board in your home gym and hang it in front of your weight bench, yoga mat, or treadmill. You could easily make an inspiration board by just using a bulletin board or cork board and putting images and quotes related to workout training. Likewise, you could also include references, such as your achievements and the milestones you’ve achieved in your workout journey. This could be your first medal from a marathon race, or a hand written sign that says, “Twenty pounds lost!! !” Even affirmations, such as “Fit, strong, healthy” or “I am an athlete” could also help you stay motivated even when your workout training gets tough. Entertainment equipment could also motivate and inspire you to carry out your workout routine for long periods. Best of all, if it’s something that you greatly enjoy, it would definitely eradicate the feelings of boredom. You could incorporate a stereo that combines a radio, iPod dock, and CD player in your home gym. By spending a little bit extra, you could get a model that has a remote control, allowing you to easily change the music without stepping out of your workout spot. Also, a TV set could be an important piece of equipment in a home gym. It would be better if it has a DVD player. This would give you the privilege of performing home exercise DVDs. Aside from being an instrument that allows you to check yourself while you workout, having a wall-size mirror could also open up a small space and make the room brighter. Be creative. If you’re tired of staring at imaged of famous athletes, you could tack photos of families and friends. This would help you exercise better and have a healthier lifestyle to live longer. Whatever your goal is, just hang your favorite photos in frames, since it’s better than using tapes or tacks. Space, decoration, and entertainment are all great, but what about the core ingredient to a home gym? The equipment itself. This is one of the most common questions that beginners have, and it’s why we’ve already got a few articles dedicated to the subject. What three pieces of equipment are essential for every home gym? A special thank you to those who replied. There are some really insightful answers. Let’s see who they are and what they said! Brad offers coaching to athletes of a mixed level in order to bring them up to peak performance. 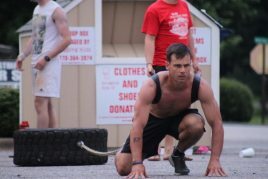 His site over at SealGrinderPT has some active forums and you can tap into experience from a NAVY SEAL and CrossFit Level 1 certified trainer (Brad himself). If I were building a new garage gym the 3 most important pieces of gear I would include first are a good barbell, bumper plates and a set of wood rings. Perhaps my single most favorite workout tool is a suspension trainer. They’re not too expensive (depending on what brand you purchase), they allow for a lot of exercise variety, they don’t take up much space, and they’re super travel friendly. In addition, I think adjustable dumbbells are another great addition to a home gym since they don’t take up much space and allow you to perform a wide range of exercises. Finally, my third piece of equipment would be a chin-upbar with various grips. Jason Fitzgerald is a USATF-certified coach, 2:39 marathoner, and the founder of Strength Running. Any home gym needs just a few pieces of versatile equipment. A medicine ball is a perfect strength tool because it can be used for so many exercises – upper body, core, and lower body. For runners, it’s almost indispensable and why I created the Tomahawk medicine ball workout. I also recommend a pull up bar that can be put in a door frame (perfect for both pull ups, chin ups, and many variations of these exercises). Finally, a piece of rubber tubing like a Thera-band is useful for adding resistance to many body-weight exercises. Nice shout with the Thera-band! Mike is the man behind Muscleforlife.com, where you can learn “how to build the ultimate physique”. He gave a really detailed response, so I saved it for last. Cheers Mike. You won’t be able to lift heavily or safely without a power rack.You’ll use it in just about every workout you do (you’ll bench press,squat, military press, and even deadlift in it if you’re short onspace). Moving a barbell around is what real weightlifting is all about. Yousquat it, pick it up and put it down, and push it, and your body getsbigger and stronger. A traditional set of dumbbells is a workable solution, but they can beproblematic as well. If you’re a guy, it’s not only quite expensive toinstall a rack that goes as heavy as you’ll need, it takes up quite abit of space. Lastly, as much as possible, never buy anything that would just accumulate dust in the long run. If you have $100 to spend, spend it the way you’re going to spend a million dollars. What we’re trying to say is, buy what you’re going to use, not just what looks aesthetically pleasing. Don’t blow your budget in items that you just saw on late-night TV because of impulse. It’s also a good idea to build up your home gym slowly, and add to it when you have the budget. Setting Up A Home Gym – Power Cage or Squat Rack?